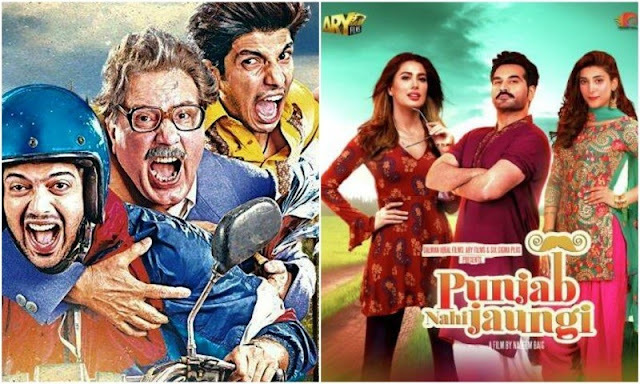 Punjab Nahi Jaungi and Na Maloom Afraad 2, get released head to head this Eid, but that doesn't really fall well when it comes to the shows. A sad reality but this time, cinema owners have been biased in awarding screens to the respective films. The reason being, their direct stakes in the movie, Na Maloom Afraad 2. According to Irfan Malik at ARY Films, "I am aware that there is a lot of noise about unfair distribution of shows at Nueplex and Cinepax between the 2 Eid releases and I also wish the exposure could have been the same for both in these cinemas but unfortunately its not. The only reason i can think of is that both these Cinemas are also co-producers of NMA 2 and I suppose "Punjab Nahi Jaungi" is a serious threat. Someone said if u cant beat it fair and square u try to kill it! (Joking). We are still negotiating with them though and are hopeful to reach some positive conclusion. We know we have a great film on our hands and approx. 120 screens to play with so hoping for the best. We at ARY FILMS try to create good positive cinema and follow it to the core! May Allah be with all of us." Malik further added, "Exhibitors have been indirectly contributing to the film making process (until 90s) by giving Minimum Guarantees to the distributors who in return would promote, distribute and guarantee the release of the film on the announced date. In other words distributors brought credibility to the dealings between the exhibitors and producers. This practice provided a solid base for consistent film making between the 60s to 90s. It will be great if we could start the same practice again. I believe exhibition, distribution & production are specialized areas and thus will only give optimum results if handled by specialized people/organizations. I also believe that its a matter of prerogative if a business unit wants to explore other areas of the business. Its a free country after-all." In defense of the claims being made, Mohsin Yasin, of Cinepax, mentioned that the cinema house was giving equal shows to both movies. However, scheduling as per on the website suggests otherwise. Nueplex representatives however remained unavailable for all sorts of comments and with a direct stake in the movie, only a diplomatic answer is expected from the aforementioned cinema owners. Last year there were three major Pakistani films up against each other on Eid-ul-Azha. Still all of them got a fair chance to rope in their audience. This year too, the two movies up competing for foot fall should have been awarded well balanced shows. Until now, the audience has been showing massive interest in both the movies up for release and it would have been best if well balanced shows were awarded to both of them so that the public could enjoy the other, if the first was house full. Both teams seem to be supporting each other on the surface level but deep down there is a desire to have one's own product fair well than the other's. The producers have perhaps played their ultimate trump card, with three of the biggest cinema chains in Pakistan behind Excellency Films and their direct stake in Na Maloom Afraad 2, it doesn't come as a surprise why major screens have been awarded to the movie. This should have been expected when one was subjected to the screening on the trailer for the movie, twice between the screening of any movie, local or international. Will Punjab Nahi Jaungi be able to do well, despite the bias? Well, certainly. If the content rings well with the audience, the cinema owners will have to cater to the demand. But it should have been a fair game, after all doesn't it boil down to strengthening our own cinema industry rather than being up against each other and going at the throats for a live session of Game of Thrones here?